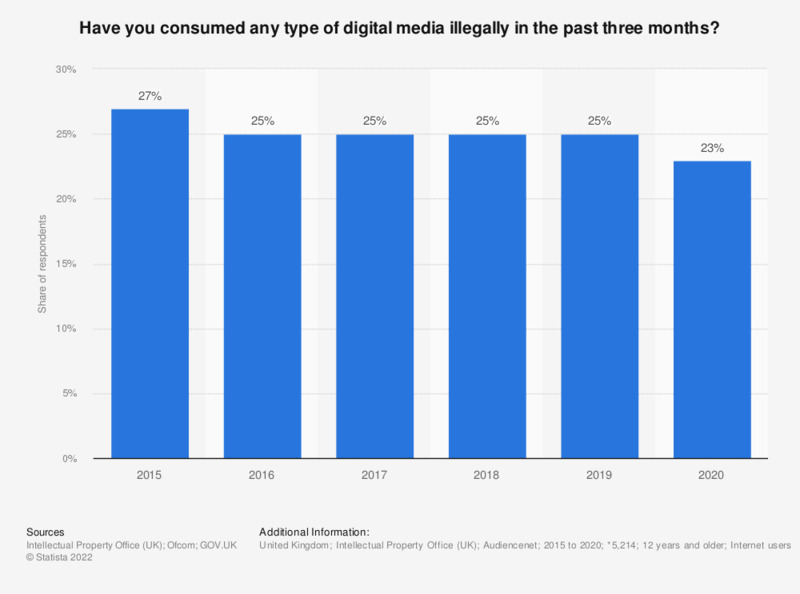 This statistic displays the findings of a survey on the illegal digital media content consumption in the United Kingdom (UK) between August 2012 and March 2018. During the survey period in 2018, it was found that 15 percent of responding internet users reported consuming any media illegally in the past three months prior to the survey. * Digital media types include: music, films, TV programs, computer software, e-books and video games. ** Base of most recent survey wave (Wave 8). Base varied by wave: n (W2) = 4,728; n (W3) = 4,708; n (W4) = 4,673; n(W5) = 4,552; n(W6) = 4,670; n (W7) = 4,573. Everything On "Cyber crime and cyber security in the United Kingdom (UK)" in One Document: Edited and Divided into Handy Chapters. Including Detailed References. Were the TV programs you consumed paid or free? To what extent do you agree or disagree with the following statement: “It should be illegal for the general public to buy fireworks“?